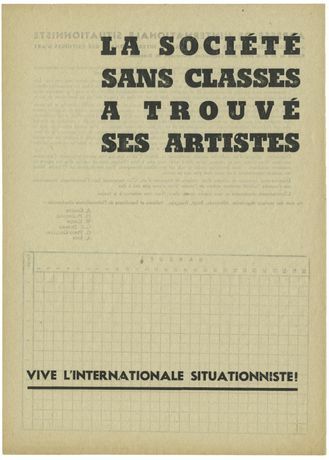 Between 1957 and 1972, the Situationist International (S.I.) first projected a “revolutionary front in culture” and then shifted its propaganda to the political field. Employing ludic methods, the movement offered a fundamental critique of the spectacle of a consumerist society. In an age in which the principles of the market economy are increasingly permeating all areas of life, The Most Dangerous Game instigates a new envisioning of the years in which the S.I. articulated its critique. The exhibition’s starting-point is the Bibliothèque situationniste de Silkeborg, a venture that Debord drafted in outline with the painter Asger Jorn in 1959 for the latter’s museum in Denmark. At HKW, this project, which remained unrealized in its day, is for the first time re-constructed in its entirety. An Archive of Last Images presents for the first time works by all artists active during the initial S.I. period.